Early in the afternoon on the Sunday before Thanksgiving, I landed at the Athens airport, which is a good distance outside of the city. I got a bus to Dafni, where Katie lives. The first thing I saw from the bus was a billboard, in English, advertising travel to Greece. This struck me as a bit late to be making the sale. This billboard turned out not to be the only thing in English. Quite a few signs, in fact, were in English. As I rode the bus and tried to sound out signs in Greek, I would quite often encounter an "R" or an "S" and realize that the sign wasn't meant to be pronounced in Greek. The public transit signs are all bilingual, and English colloquialisms abound. Aside from the man-made features, I was struck by the mostly-barren, rocky, short mountains (or very tall hills, anyway) that punctuate the city. It seemed very strange to me; I can understand a city surrounded by undeveloped mountainside, but I was surprised by the undeveloped mountains surrounded by city. We spent the remainder of Sunday and most of Monday around Athens. We changed cash, which I didn't bring enough of. I had been told that everyone accepts Visa, but this wasn't always true, especially on Santorini. I had also been told that the transactions were cheaper in Greece than in the U.S.; this seemed to be true. We also got tickets and lodging for Santorini, and I got a book about the modern Greek language. Modern Greek pronunciation is a lot easier once you realize that almost all vowel combinations are pronounced "ee". The word for ticket, for example, is εισιτηριο. Transliterating the consonants into English, this is ειsιtηrιο. It is pronounced, "eeseeTEErio". One important exception is υ, which is pronounced "ee" by itself, but which, when it comes after α, ε, or (if I recall correctly) ι, is pronounced either "v" or "f", depending on whether it's followed by an unvoiced consonant. A few good words to know: παρακαλω (parakaLO) is used for "please", "you're welcome", and "can I help you? "; ευχαριστω (efhariSTO) is "thank you"; σιγνομι (sigNOmi) is "excuse me", and probably misspelled. You can ask whether someone speaks English with "Μαλατε αγγλικα?" (mahLAHte angleeKAH), though I suppose you can also ask "Do you speak English?" and see whether they say "yes" or give you a blank stare. You won't need to know "ENOIKIAZETAI", but since you'll see it everywhere and might be curious, it means "For Rent", and is pronounced "eeeeeee". Santorini is a small island two thirds of the way from Athens to Crete. It is the southern-most of the Cyclades, the group of islands of which it's a member. 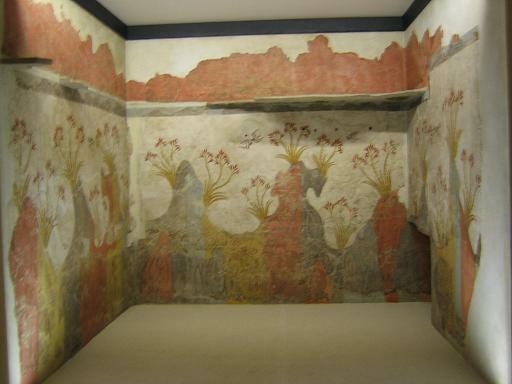 There was an important Minoan settlement on the southern coast called Akrotiri. The Minoans called it "the round island", which was sort of ironic, since two thirds of the island disappeared in a volcanic explosion in the middle of the second millenium BC. The eastern third of the island remained. This part was named Thera, after the leader of a later settling party. Within the last millenium it was renamed Santorini, after Santa Irini. The name has officially reverted to Thera, even though nobody calls it that except the Greek government. Like most democratic governments, Greece's puts very little weight on the views of its citizens. Santorini is now crescent-shaped. The inside (west side) of the crescent drops off sharply into the bay. The outside slopes gently to the Aegean sea, except for a large hill in the southeast. 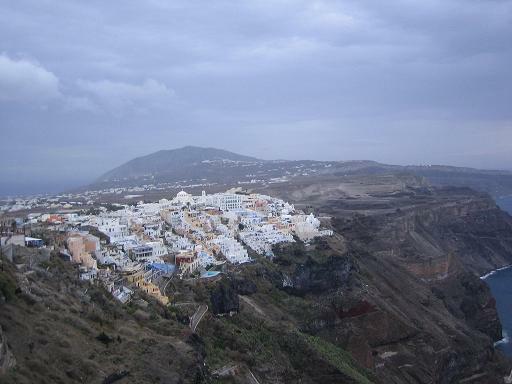 The main town, Fira, is in the middle of the west coast. We arrived late Monday night. A shuttle from our hotel picked us up at the dock, a few miles south of Fira. We went up the hill on a road with about eight 180-degree turns, then north through Fira and just past to the hotel. On Tuesday, we visited a couple of museums. 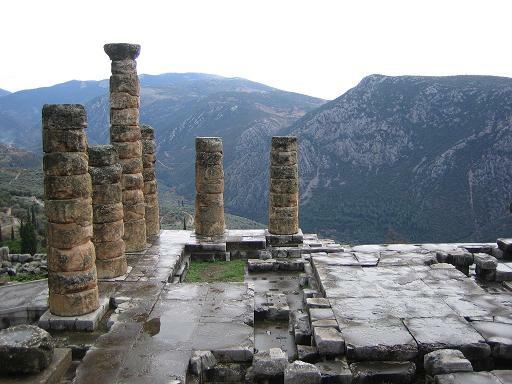 Most of the material from these museums was from Acrotiri, dated to the 17th century BC, shortly before the explosion. There seems to have been some warning that an explosion was coming; no human remains have been found at Akrotiri, but the locals didn't take many of their things with them when they evacuated. Much of what was left behind was pretty well preserved. Most of our time in Santorini was spend just wandering around Fira. The Greek islands use a lot of white and blue and liked to lay out their paths in such a way that, in case of a pirate raid, the locals would have an easier time finding their way around than the pirates would. If you've been to Boston, the idea is similar. I have a lot more pictures than I'm going to put up here; if I see you at Christmas, remind me to show you some of them. We would have left Wednesday afternoon, but the wind was too high for the boats, so we spent an extra night and left early Thursday morning. 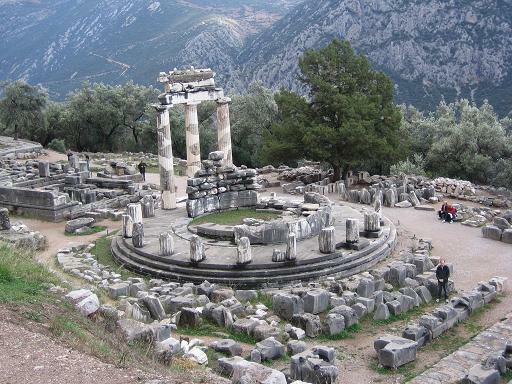 We spent Friday in Delphi and on the bus to and from. The bus from Athens takes three hours each way, which gave us quite a bit of time in which to sleep sitting up. It occurs to me now that I'm not sure what to say about the place. The scenery is lovely. 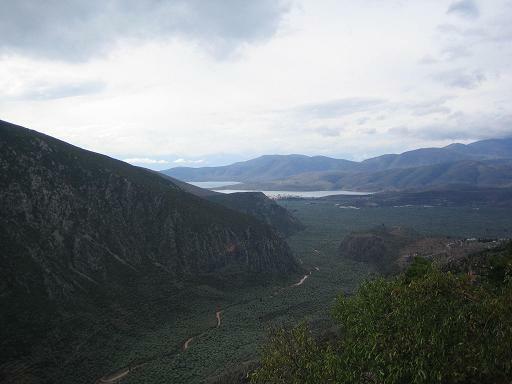 It's set on the side of Mount Parnassus, bordering a valley which leads to the Gulf of Corinth. I was surprised by how completely ruined the ruins were. What we saw was mostly the footprint of what had been there, with a few reconstructions. At one point I noted the reconstructed Treasury of Athens and said, "just think — that building has been there for nearly 200 years." Katie wasn't terribly impressed with my sarcasm. The theater and the stadium were in pretty good shape, since they were pretty much just terraced parts of the mountains with stone seats. 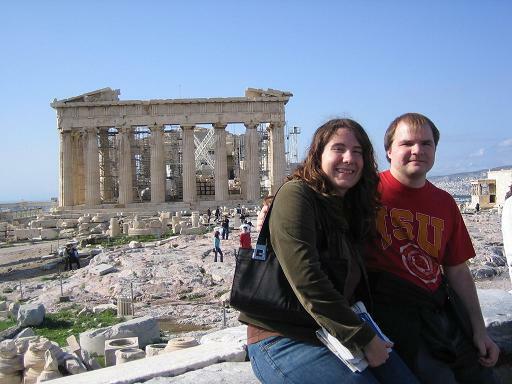 Here's the Temple of Athena, with me at the lower right. This originally consisted of 20 pillars in a circle holding up a dome. The three pillars you see, and the little bit of a dome, is reconstructed. We planned to do the Athens archeological museum and the Acropolis on Sunday, since there's no admission charge on Sunday and it was otherwise convenient. When we woke up, it was raining, but by the time we got to the Acropolis, it was beautiful. 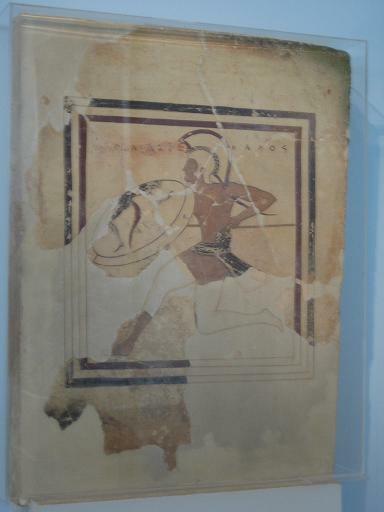 Terracotta votive plaque, painted in the black-figure style, showing a hoplite runner with helmet, spear, and shield with the emblem of a dancing satyr. The inscription on the background originally read "Megakles is handsom [sic]". Later on Megakles' name was erased and Glaukytes' name was substituted. Work of the painter Euthymides, dated in 510-500 B.C. The old Agora is just northeast of the Acropolis. Among other things, we saw the footprint of the headquarters of Athenian democracy and a medieval church built in honor of Saint Paul's having preached there. I considered asking Katie how to write "Paul was here" in Biblical Greek, but thought better of it. My bus to the airport Tuesday morning was at 3:00. Katie and I got there a couple of minutes before it left and said goodbye. The way out was like the way in, only more familiar. I could pronounce more of the Greek, or at least recognize that it was Greek and not English. I recognized the names of some of the stops and streets closer to Dafni. And as for the billboard suggesting I visit Greece — I think I'll take its advice. UPDATE: See also Katie's account.